Knives have many uses in the kitchen. If you want to get really fancy, the right knife, as well as the right method, can produce the perfect julienne or chiffonade. But there are other things using the right knife can do you may not be aware of – yet. One of the most important is increasing the nutrients foods provide your body. The former preferred method of leafy green processing used by experts was tearing instead of cutting. Tearing was thought to have less tendency to disrupt the cells, causing nutrients to leach out. It is now known that chopping with a knife may also be beneficial. One of the benefits of chopping veggies has to do with increasing polyphenol levels in foods. Polyphenols are plant compounds that may reduce the risk of three common health conditions: urinary tract infections, cardiovascular disease and type 2 diabetes. If certain vegetables get nicked or cut, they will produce more polyphenols to defend against further damage. 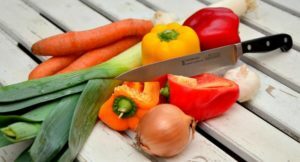 Chopping or slicing vegetables may make these polyphenols more bioavailable to the human body. Fun Fact: Browning of foods like apples and avocados is one of the problems with cutting them but, ceramic and plastic knives are “chemically inert,” which is said to slow the browning process. In testing, plastic knives prevented browning a full day longer than metal, and using a ceramic knife, avocados took visibly longer to turn brown. Iron and copper blades speed up the browning process. This is what most stainless steel blades are made of.